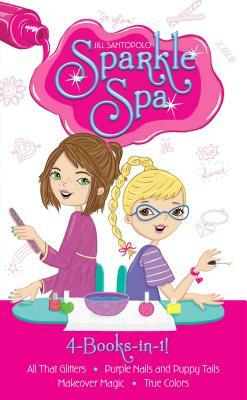 Brooke and Aly are sisters, but they're more than family--they're family business owners This bind-up includes four Sparkle Spa stories, from the start of their kids-only nail salon to the polished (and unpolished ) adventures that follow. In Purple Nails and Puppy Tails, Aly and Brooke agree to do doggy makeovers for the Annual Pup Adoption at the local shelter. But dogs aren't exactly ideal mani-pedi customers, are they?